Thomas Neeser has an impressive star-rated culinary background. 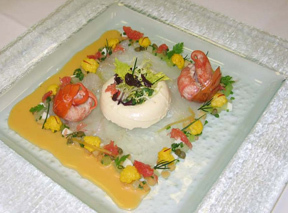 Before joining the Lorenz Adlon in 2000, Chef Thomas Neeser worked at the two-star Michelin restaurants, Michel Chabran in Pont de é'Isère and Palme d'Or in Cannes, and at the three-star Michelin restaurant Auberge de l ‘Ill in Alsace. 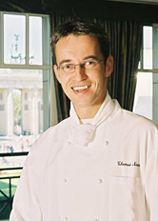 The Lorenz Adlon features French haute cuisine and has maintained its Michelin-star since 2003 under Chef Thomas Neeser's guidance. * Please note that these recipes all require several days of advance preparation. Preparation: Prepare a mixture of salt, sugar, spices and coarse chopped herbs. Cover the pike-perch filets with the mixture and marinate for 24-36 hours (depending on the thickness of the filets) in the refrigerator (turn over twice during this process). Cut the marinated filets in thin slices. Preparation: Cut the cauliflower in thin slices, sauté quickly in butter and add the broth and cream, cover and cook slowly until the stock is nearly absorbed. Beat the cauliflower with a mixer, pass through a strainer, and add the soaked the gelatin leaves. Place the pan with the caulflower on a bowl of ice, stir until mixture is cold, and then add the double creme. Pour the mixture into round forms and place in refrigerator until the mixture is set. Filet 1 of the grapefruits and the pommelos, squeeze the juice leftover and set aside for the vinaigrette. Turn the filets in lime oil, sprinkle with Sancho pepper and icing sugar and marinate for 1 hour at 80° C (175° F). Preparation: Cook the cauliflower florets al dente in chicken stock, some champagne vinegar, and saffron, and cook until the cauliflower has turned yellow. Strain the cauliflower and mix with the remaining garnish ingredients. Preparation: Chop the shallots and mushrooms in slices, sweat them in olive oil, and then add them to the grapefruit and pommelo juices. Add the pepper and reduce the liquid to a third, strain, add cream, and whip with olive oil. Serve warm. Preparation: Mix the broth, butter, olive oil and lemon juice together. Heat the crayfish tails and glaze lightly with the sauce. Presentation: Place the pike-perch on a plate, top with the savarin in the middle, and decorate with herb salad. Arrange the garnish on the savarin, drizzle the vinaigrette on the plate over the garnish. Add the glazed crayfish tails. Preparation: (Sauce) Chop the meat into large pieces. Mix all ingredients and marinate the meat for 4-6 days. Strain the marinade into a pan and bring to a boil. Remove the foam, strain through a cheesecloth and set aside. Preparation: Dry the meat, season with salt and pepper, and sauté in hot oil together with the vegetables. Add the tomato pulp and cranberries, roast for a short time, add flour, and flambé with cognac and gin, add the reserved marinade, the venison stock and simmer 2-3 hours. Remove the meat and vegetables, and reduce the liquid to a sauce consistency. Pass the sauce through a sieve, bind lightly with beurre manié, stir in the blood and finish with the chocolate. Season to taste with freshly ground black pepper and cayenne pepper. * Note: Beurre manié is a mixture of equal parts softened butter and flour. Roast the medallions of venison until medium. Preparation: Blanch the Brussels sprouts, and glaze with bacon and shallots. * Note: Brunoise is a term that means the vegetables are julienned, turned 90 degrees and then cut cut again, to create consistently sized diced pieces. Preparation: Place the spätzle dough into a sieve, push the dough with a spatula forming pieces 2 cm long x 0.5 cm thick (0.8 inches x 0.2 inches), over a pot of boiling water. Boil and then immediately place in an ice water bath to stop the cooking process. Drain. Preparation: Mix the spätzle in butter cooked until foamy with walnuts and breadcrumbs for finishing. 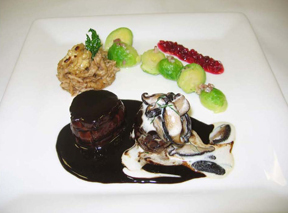 Preparation: Make a shiitake mushroom cream. Preparation: Make a stock with the ingredients, bring to a boil and then simmer for 30 minutes. Bring to a boil again, and add the peeled and cored pears. Poach until al dente. Let the pears cool in the stock and then place the pears and stock in the refrigerator for 2 days until the pears are colored approximately 5 mm (0.2 inches). Remove the pears from the stock and let drain. Cut the pears into a bowl, flambé lightly until the edges of the pears are brown. Preparation: Bring the milk, cream, coffee beans and spices to a boil, simmer for 30 minutes, and then pass through a sieve. Add the butter, egg yolks, and sugar to the cream mixture. Let cool and then freeze in an ice cream machine. Preparation: Make a dough with all of the ingredients, and let rest for 4-5 hours. Roll the dough out to 3-4 mm (0.1-0.2 inches) thickness, and cut into rectangles, 3 cm x 12 cm (1.2 inches x 4.7 inches). Bake in a preheated 180° C (350° F) oven for approximately 15-20 minutes, remove from oven and let cool. Sprinkle with chopped nuts, meringue and icing sugar, and caramelize lightly. 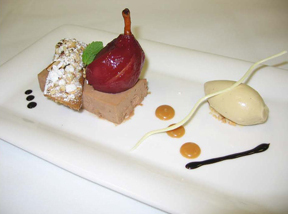 The Lorenz Adlon is open for Dinner 7:00 pm - 10:30 pm from Tuesday - Saturday. The restaurant is closed on Sunday and Monday. Read about the Hotel Adlon Kempinski and the Lorenz Adlon in the Hotels and Resorts, Restaurants, Chefs' Recipes, and Spas sections.